My advice to anyone embarking on a student exhibition is to plan, plan, plan some more… and be prepared to compromise! What sort of show do we want (e.g. minimal, salon hang, interactive, multi-platform)? Why are we having a show (what does it need to achieve, who is it for)? Where is it going to be (e.g. in a gallery space, studios/workshops, corridors, off-site) and how can these spaces be adapted? Do students have an input into the planning of the space? Who decides what goes where – the course leader, subject leader or the students? This may sound like an obvious tip, but in the pursuit of ‘trying to get everything done’, it’s easy to overlook the simple process of communication with your students. Talk to them in good time. Give them a flavour of what’s to come and get them excited! Talk to each student to gain an understanding of their requirements for the exhibition and to ensure that their individual needs are taken into consideration. Some courses have very large cohorts so it is useful to collate this information in advance for the whole team to work from. There should be a visual consistency running through your show collateral and promotional materials, including but not limited to: labels, statements, invites, posters, social media assets, digital content and show signage. This may even include agreed hanging processes and other methods for displaying work. Clearly defined roles will help to minimise creative and conceptual disagreements. Provide everyone involved with a clearly defined role at the beginning of the planning process (including staff, technicians and students) and create a short written guide to ensure that they all have a shared approach to the exhibition. 5. Understand your deadlines – and stick to them! Develop a clear week-by-week plan, including key responsibilities and deadlines, at the beginning of the final major project. Share it with your students and all staff involved in the process (including support staff, caretakers, security, health and safety and marketing). Ensure you allocate appropriate amounts of time for building the show, hanging work, marking work and the external moderation visit. As a curator, you need to find a way to pull all of the projects together in a cohesive way. 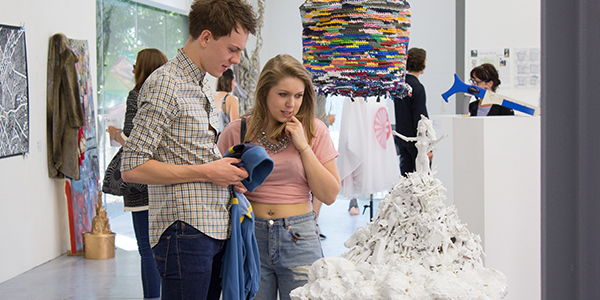 Students generally want the exhibition to represent their own individuality, so compromise is necessary! Publish a list of dos and don’ts for students in advance of the show. This might include aesthetic considerations, health and safety guidance and hanging instructions. It can also be helpful to share a code of conduct outlining the behaviour you expect from your students. Hold a wash-up meeting at the end of the exhibition with all of the staff involved. This will help you to review what went well and what could be improved ahead of next year’s show.